The Solomon Cramer Fund has generously provided the funds for this three-part leadership and camp scholarship opportunity. Through three events, participants ages 16-18 will learn and use leadership skills that are suited uniquely to them. 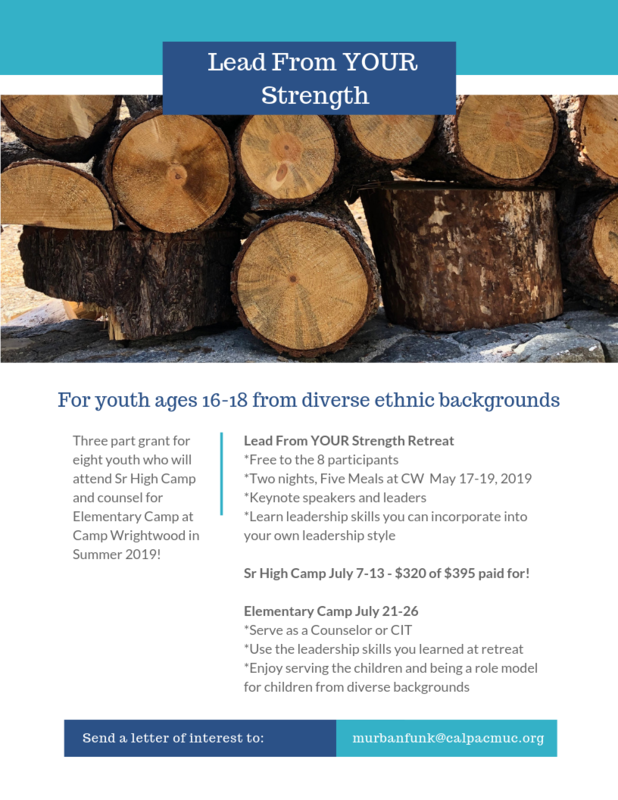 The first piece is a Lead From YOUR Strength leadership retreat at Camp Wrightwood, May 17-19, 2019: Two non-anglo leaders will help the 8 youth selected for the program find and develop their own leadership skills and style. The next phase of the program is funding for Sr High Camp. The grant in addition to Camp Wrightwood scholarship money will pay $320.00 of the $395.00 camp fee for Sr High Camp (July 7-13, 2019) at CW. Phase three of the experience is serving as a Counselor at Elementary Camp at CW (July 21-26, 2019). This allows the eight participants to use their leadership skills/style and serve as role models for elementary-aged children from non-anglo families. Selection process involves an application for the Lead From YOUR Strength opportunity and registration for both Sr High Camp at CW and Elementary Camp Volunteer Staff at CW. After applications and registrations have been submitted, interviews and selection will be made. Deadline for submitting applications is April 24, 2019. Candidates will be chosen by April 30th.